Want the secrets behind Key West’s favorite recipes. 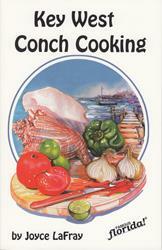 “Conch (say “konk”) Cooking” presents a nutritious alternative to the usual seafood fare and a delicious one! Joyce LaFray’s collection, which includes time-tested recipes from Florida’s famous restaurants and others, is sure to tempt both adventuresome palates and waist-conscious readers. Discover particulars about the conch, including easy-to-follow directions on removing the meat from the shell and tenderizing the queen conch. Recipes include favorites from Mangrove Mama’s in Sugar Loaf Key, The Pier House in Key West and Marker 88 restaurant in Plantation Key. Now that conch meat is available in most seafood markets in the U.S. and abroad, this book will prove to be an invaluable cooking tool.